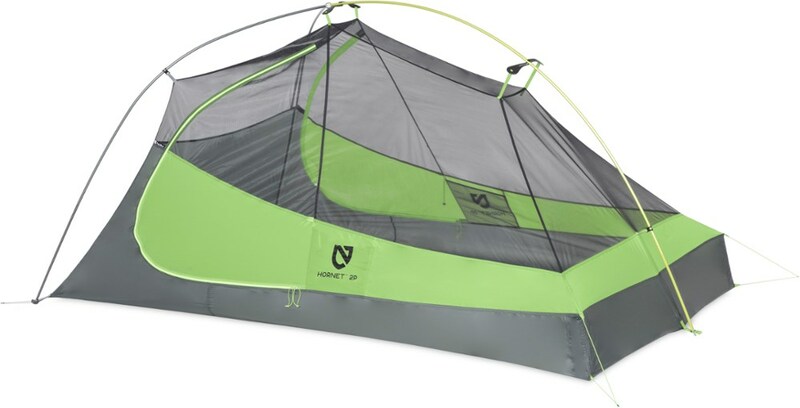 The Nemo Hornet 2P is an incredibly versatile shelter in the hands of experienced users, but falters some as a 2P shelter and in the hands of those less experienced. On muggy summer nights a hammock and bugnet are my first-choice of shelter. The thin synthetic fabric of a hammock allows heat to escape and increases evaporative cooling on the underside of the body for comfort on warm nights that other shelters simply cannot deliver. Unfortunately there are times when there is nothing to hang a hammock from and "going-to-ground" is my definition of a total shelter failure on the same scale as "going-to-car". Moreover in cooler weather hammocks start to get complicated and more expensive to use. For those who like tinkering and fiddling with things the hammock is a platform like no other, but for those of us who just want to get some sleep and relax the amount of cords + tarps + insulation + hardware + drip-lines + etc. gets absurd. Unlike hammocks, a bivy is a simple and cheap piece of gear no matter what time of the year you use it and it goes-to-ground like a duck to water. There is something beautiful about the simplicity of a bivy. Weather permitting there are no knots + cords + stakes + poles + etc to mess with. Just toss it on the ground and crawl inside. The view is better too if you like wildlife. Unfortunately bivies are not always a perfect shelter choice. Bugs are generally a nightmare since there are a lot of things you cannot do in a bivy and though I do not use mine in warm weather (because of bugs), I would guess that it gets a bit steamy inside on warm nights. The hammock and bivy I use perform well at the extremes of my time outdoors, but they do so by being less flexible during the parts of the year when the temperatures over a weekend can swing wildly. Tents are the most common form of shelter for good reason and it is because they serve the middle-ground well. In fact, I use a tent (REI Half Dome Plus) for couples-backpacking and group canoe trips when I plan to pitch on sand and gravel bars with others. The problem is that while the tent is great for sleeping two comfortably underneath the security of a 40D fly, it is much too heavy for solo-backpacking at 5 lbs. The new lightweight backpacking tents are in my opinion the only viable tent option when light and fast are part of your adventure. 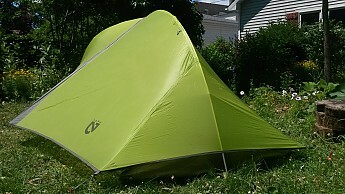 The question I had going into this review is whether these new tents can serve reliably enough on the trail. For the testing of the Nemo Hornet 2P I elected not to do any kind of "exposure" test. I simply do not believe these test tell you anything useful about long-term use. Most experienced campers try to limit the amount of direct sunlight their shelters are exposed to. So attempting to "speed-up" the results of sun and weather damage through long periods of exposure is not a valid test for me. Instead I chose to use the tent as much as I could as an experienced user would (in situ). I admit that this was partly because I wanted to know how it would serve my purposes (which do not include looking at it in my yard), but at the same time there are plenty of reviews out there on how these new lightweight tents stand up to weeks in direct sunlight and I wanted to use my opportunity to push our understanding of these tents in new directions. I am sad to say that the Hornet 2P never made it too far out of the wooded hills and river-valleys of my Midwest home during the testing period. I had planned to take it on a kayak trip to the coastal waters and estuaries of south Florida (a region and type of trip where I believe it would excel), but that trip never happened. In the fall I did use the tent on two trips, both of which had heavy rainfall and one of which the amount of rain compelled me to exit the trail after the first night. Over the winter I attempted to test the tent in light snow (where I believe it would have performed well thanks to its slippery silicon fly), but Mother Nature did not cooperate and there was no snow to be had. In early spring I tested the tent on two overnight trips (one as a couple). These trips also had heavy rainfall. The testing concluded with a multi-day solo-kayak trip near the end of May and a group kayak trip in the middle of June. The weather was warm and pleasant for both trips and there was ample splashing. Overall I feel like the testing was robust. I did use this tent as though it were my own, which basically means I picked up big sticks before pitching the tent and dried it out when it got wet (anything more and things are getting into fiddly hammock territory). Where my testing might deviate from other tests the most is that I was very deliberate about my site selection in terms of protection from driving rain. I believe that given the current state of technology a rain fly with a 1200mm rating is susceptible to misting from long periods of driving rain (see the review by Patman for the Fly Creek UL2 for a similar take). What I believe happens is that once the fly becomes saturated the pressure of driving rain can push moisture through the inner side of the fly. That in mind, I pitched the Hornet 2P under the cover of trees to slow down the speed of falling rain when I expected heavy rains for any significant period of time. Whether or not my theory is correct, under the cover of trees I never had any issues with misting despite the near constant rain the tent endured on the trail with me. The floor space of the Nemo Hornet 2P is 28 square feet, which amounts to just a little under 2.4x6 feet for each person—a great size for a coffin, but not much else. I shared this tent only once with another person, and though she is 5'4" and weighs less than a hundred pounds I thought more than once about opening the door and gently nudging her out. That said, the Hornet 2P is a palace for a solo-hiker. You can flop-around as much as you like. I loved it. Similar story for the headroom. At 40 inches it was more than roomy enough for a solo-hiker to do all sorts of things while sitting up, but the sides taper in such a way that two people must angle their heads in different directions to prevent breathing on each other. The marketing of such a small tent as a viable 2-person shelter is not unique to the Hornet 2P and most manufacturers exaggerate the capacity of their tents beyond what many of us would consider tolerable, much less comfortable. 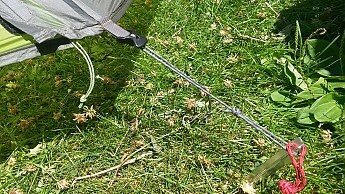 Though the Hornet 2P will technically stand upright without staking it out it is decidedly not what most of us imagine when we think of a free-standing tent. You can sleep in the Hornet 2P without staking it out (I did), but the tent fabric at the foot-end of the tent wraps around your feet as you move at night and you will eventually get up in the middle of the night and stake it out. 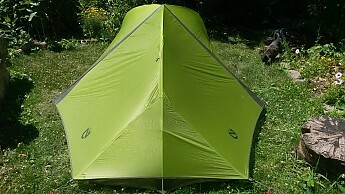 Like the misleading capacity claims above, the murky definition of free-standing tent is not unique to Hornet 2P—the Fly Creek UL2 and the Quarter Dome 1 both claim to be free-standing tents, but like the Hornet 2P also require staking out. The 3-pole hub-design of the tent makes it very susceptible to collapsing from wind gust to the sides of the tent, but pitching the tent along tree lines and behind terrain features can go far to reduce this impact, and is a generally smart practice anyways. 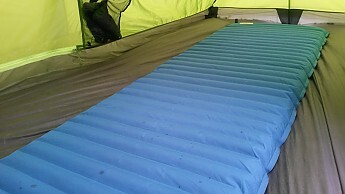 One of the unique features of Nemo tents is their ventilation system. 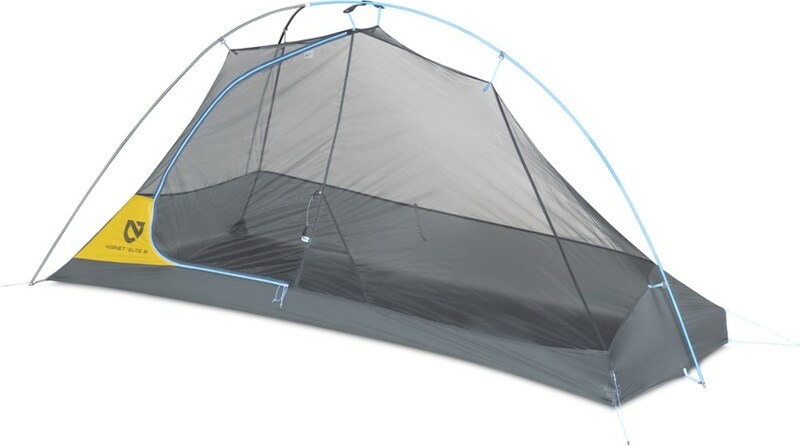 Like other tents the exo-skeleton type frame helps maintain a large area of space between the fly and inner-tent even when the fly becomes saturated with water and sags. 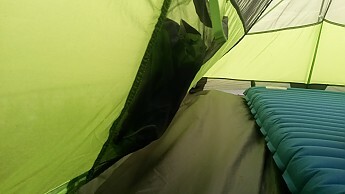 Where Nemo differs is that by turning the head-end (large side) of the tent more into the wind the partial-fly in combination with the privacy screen at the base of the inner-tent forces air up and between the fly and inner-tent where warm air collects. This is a very promising innovation for small tents which characteristically have poor ventilation, but I would suggest that Nemo take this innovation further by placing a vent at the foot-end of the tent so that warm air can escape easily under its own thermal power (passively), rather than relying on an outside breeze to move warm air down and over the bottom edges of the fly. When the hatches are all battened down it can get a bit stuffy inside without a sufficient breeze. Another standout feature of the Hornet 2P is the two-door and vestibule design. The doors of the Hornet 2P are smaller than those on the Fly Creek UL2, but not in any way that compromises their utility. 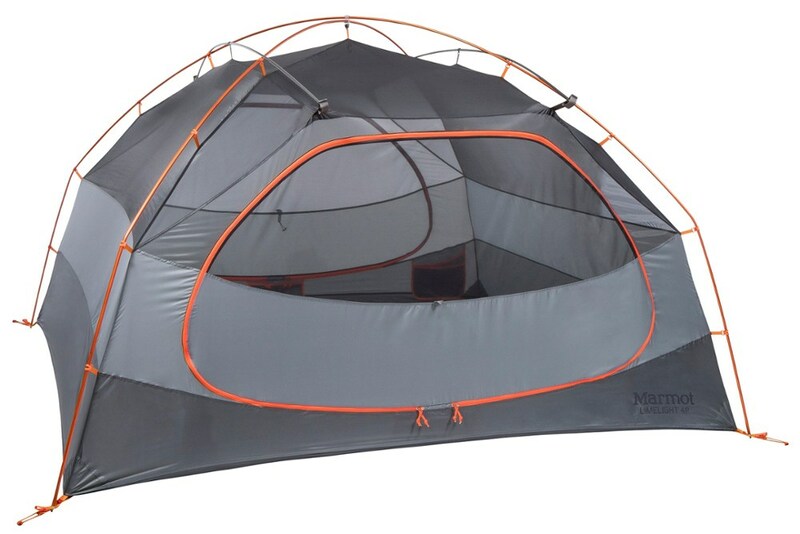 Here is where I am supposed to say that the two door design is great because it allows your partner to leave the tent without disturbing you, but as long as the person sharing a 28 square foot tent with you is leaving the tent you will not much care how. On the other hand, the two vestibules add more than 16 square feet of additional dry-space and that is something worth talking about. In practice it is probably more like 12 square feet since some of this area gets wet entering and exiting the tent, but you get the point. 12-16 square feet of additional dry-space is a real-estate deal on par with the Louisiana Purchase. 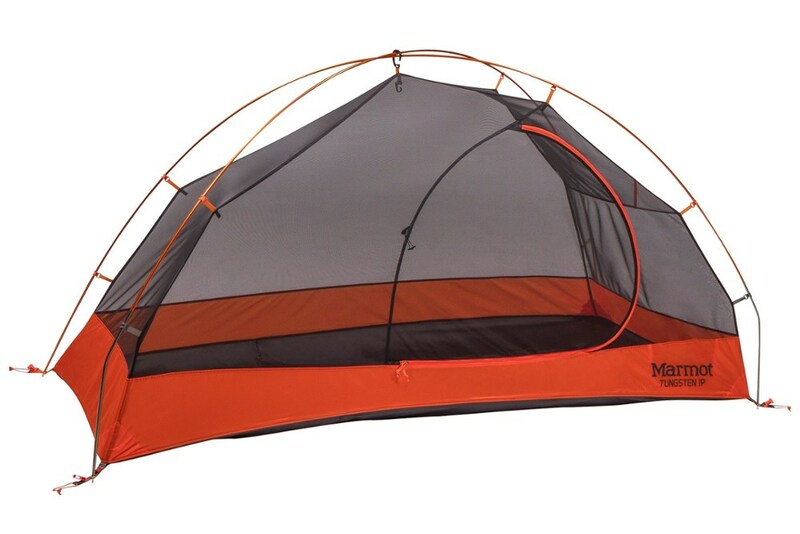 The Hornet 2P has most of the bells and whistles that are industry standards on high-end tents. The doors have double-zips so you can make a small hole for your hand to adjust your stove (or whatever) without letting everything that buzzes in. The tent is factory sealed which is a hassle to do yourself. There are tie-backs for both the doors and openings in the fly. I would never miss the tie-backs for the doors, but tie-backs for the fly openings add valuable ventilation and views. 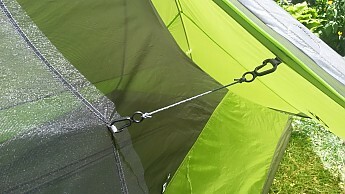 I absolutely love the decision to use line-loc tensioners on this tent. I converted my tarps to them a few years ago because they are easy to use and make re-tensioning your lines possible without leaving the protection of your shelter (though you must leave the Hornet 2P to adjust the lines at the foot-end of the tent). The small translucent pocket at the top of the tent is another win. Just turn your headlamp on and place it in the small pocket and the interior of the tent is filled with a soft light...all while being easily accessible. There were some features that performed less than admirably during my testing. The two large storage pockets on each side of the Hornet 2P are all but useless for anything heavier than a pair of socks, as heavier items pull down on the inner-tent and reduce interior space. I understand how important these pockets are to a lot of folks, so I would recommend Nemo shift these pockets to the head-end of the tent where the pockets would be more accessible and the poles of the tent could support greater weight. 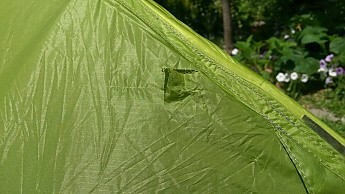 There are also side-pullouts on each side of the tent that attach to the fly. When the fly is dry these work well for increasing interior space within the inner-tent. Unfortunately, when you need this space the most (when it is raining), you really do not want to use the pull-outs because they only exacerbate the problems of a saggy fly. Overall I would say the side pull-outs work, but it is certainly an area that could use a little tweaking. 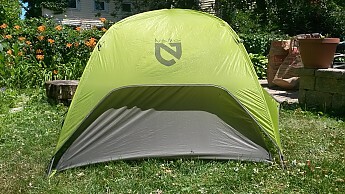 On the last trip I tested this tent I elected to let a friend use it. I did so because I had already used the tent many times and felt as though I had more or less come to my conclusions about it. I would describe my friend as an experienced tent user in much the same way as others who only sleep outdoors in the warmer parts of the year are. He owns a large Kelty tent that looks like it could sleep a hundred or so people and weighs 70 or 80 pounds...not really...but he can stand in it! To make a short story shorter, everything went fine until a strong breeze pulled the fly from my friend's hands and wrapped it around a gnarly looking tree. In many ways it was my fault. My friend was inexperienced with the slippery feel of silicon, which is difficult to handle in high winds no matter how familiar you are with it. When we finally unwrapped the fly from the devilish looking tree there was a 1 inch rip and some smaller holes in the fly. I feel terrible that the tent was damaged in my care, and truth be told I am a little embarrassed about it, but I do think there is a valuable lesson to be learned. That lesson being...consumers should be aware that specialized knowledge and care are necessary to make these lighter materials "work" on the trail. Overall I loved the Hornet 2P. 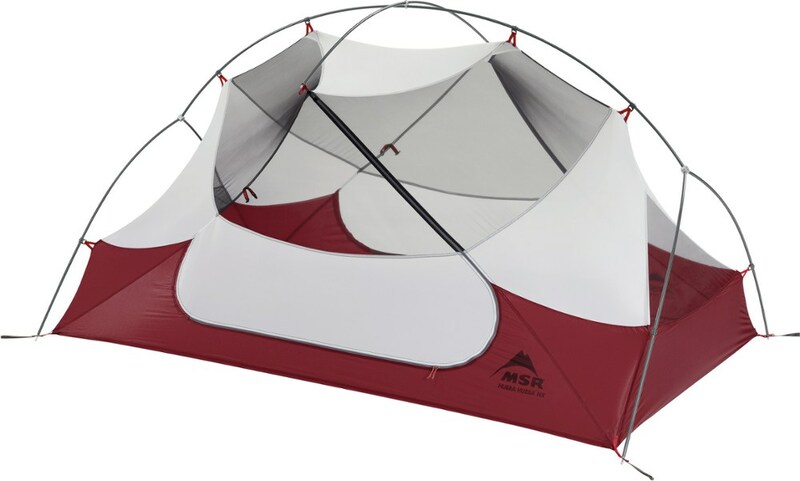 It packs down small and pitches fast and easily with the single-pole design coming together almost on its own. The fly pitches taut thanks to the easy to use and reliable tensioners on each corner and each side of the fly. 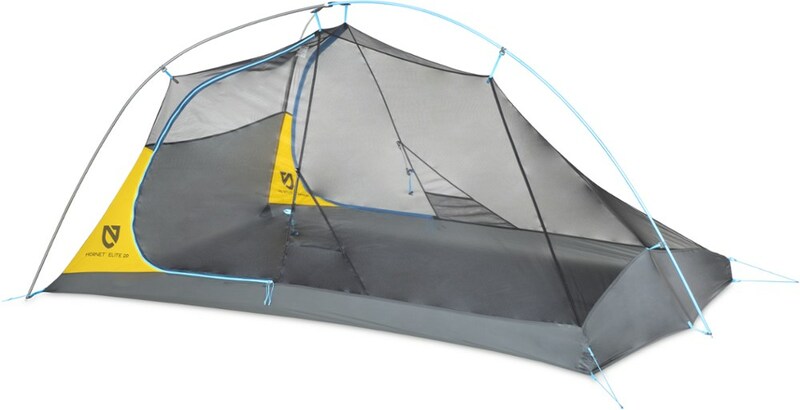 At 2lbs the Hornet 2P is very much a viable solo-backpacking shelter, which adjust to changes in weather conditions quickly and effectively and with some accommodations can endure some of the worst 3-season weather a person can experience while not on a mountain or somewhere near one of the two poles. For solo use the tent is one of the most comfortable shelters I have used and with the added dry-space of the vestibules and the ample interior space. You have a tent that allows most camp and personal tasks to be accomplished while remaining warm and dry inside the tent. There were some glitches. Coming back home with several holes in your $370 tent is not likely to please anyone. That said, I do not feel that these fabrics cannot serve users well, in return for a little mindfulness the Hornet 2P and similar tents offer exceptional versatility in a lightweight package. 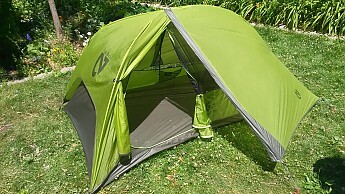 I would also caution most consumers that using the Hornet 2P as a shelter for two people could be problematic. If you are going for minimal the Hornet 2P is a smart choice for two people, but I would not expect to be thrilled about waiting out a storm in one and restless sleepers are likely to find the tight quarters maddening. As far as my closet, I am totally sold. The Hornet 2P served me well in the parts of the year that my hammock becomes a burden and my bivy is intolerable. In fact, the Hornet 2P served me well beyond those tricky months and now I find myself reaching for the tent more than anything else. Most of my trips are leisurely, and even on high mileage days an extra comfy shelter is not the worst thing in the world. would you say your review holds for the 1p as well ? are you aware of significant differences ? thanks. I have modded the rear pullouts to accept an adjustable hiking pole for true freestanding mode. I use this feature for tent platforms, sand/gravel, shallow ground cover over rocks etc, etc. I, like others, use this as a solo shelter. No issues with the fabrics as yet, but common sense must prevail. It's not for a bull in a China shop. dror - since I have not used the 1p tent I cannot say conclusively that my review of the 2p is applicable to the 1p...but there are many similarities between the two in terms of construction and materials. I would say that at a savings of 5oz. one loses a lot of value with the single vestibule and smaller floor space and interior volume...if this weight savings is a key factor I would probably suggest a bivy and tarp combo. Jim...I would love to see photos of the rear mod you are speaking of...I am not clear how such a modification would work for the staking issues I spoke of in the review. Good, but a few drawbacks. Nice tent, I just used it for a week in the White Clouds Wilderness in Idaho. It works well but there is a learning curve to the setup. It is cramped for two people but that's the price you pay for weight reduction. Speaking of that, the true trail weight of the tent including the footprint (which you must use), all the stuff sacks for poles, stakes, and fly is 2 pounds 11.7 ounces measured on an Ohaus lab-grade triple beam balance accurate to half a gram. 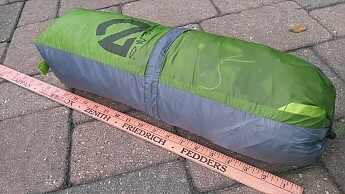 As a comparison, my Big Agnes Copper Spur packed the same way is 4 pounds 2.7 ounces, so I am saving about 1.5 pounds. That's good, but not as much as the "2 pound" tent claims. Welcome to Trailspace, James! Thanks for the review. I'd love to see some pictures of your Nemo in your review, if you have some to share. Lightest 2-person tent out there. Have used over 30 nights. Super light to carry. Does not come with footprint, but I made one. Good inside height. Stash bag. Be careful with fly zippers or it could snag the light fly fabric in wind. One night in 30 had some condensation inside rainfly (camped very near a lake) but none dripped down. Ample space on both sides in vestibule. Wind tolerant, but best in bad weather to angle tent with the foot in the wind (aerodynamic way). Glow cords. Substitute stakes for lighter weight. No problems encountered. Love this tent. Welcome to Trailspace, JD! I'd love to see some pictures of your Nemo in use, if you're willing to add some to your review. Light and awesome at home, poor out the door. I was excited when I bought the tent. It's super lightweight and easy to set up. I took it out for a spin in the local Santa Monica mountains for two nights. First night went smooth. 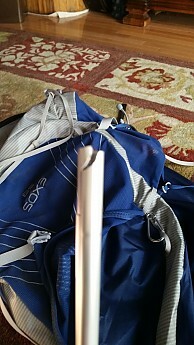 However on the second night, the tip of a tent pole suddenly snapped as I was assembling the other end of the tent. 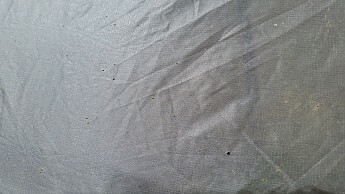 When I got home, I also discovered that there were numerous holes on the base of my tent. No problem I thought. I just bought the tent; I'm covered by the warranty. To my disappointment, the customer service rep concluded based on the pictures I sent and without any consultation with me that I was responsible for both damages. I don't think that's fair. There wasn't anything unusual I did to cause the damage. If a tent can't withstand what I put it through (which was nothing; I didn't sleep on a sharp surface (I slept on dirt); I didn't force the tent poles in (it just snapped)), it doesn't deserve to be called a great or even a good tent. I regret buying this tent. Welcome to Trailspace, songsta. I'm sorry to hear your tent didn't work out. If you're willing to add them, showing some pictures in your review of your tent and its wear would be helpful for others to see. Hi Alicia. Happy to add photos. Are there instructions on how to post? I don't see a way to do so from my phone. You can check your review and edit and update it as often as needed. thanks Alicia. I just uploaded a couple of photos. Thanks for the pics, songsta. Too bad about the customer service. Any chance you bought your tent at a retailer that would work with you on a return? Good luck! Quality, design, and the benefit of lightweight equals win. Bought my new Hornet a couple of weeks ago and when I received it I was pleasantly surprised at just how light it was. Total weight (minus bags) was 2 pounds 3.3 ounces. The footprint (I bought separately) came in at a whopping 6.7 ounces; over a pound lighter than my last shelter. Of course I had to go and set it up immediately. Sadly though I had to wait until the weekend. When I set it up though I took my time slowly setting it up in order to go over the set up. The setup is similar to my last NEMO shelter with some parts of the setup a little simpler and others a little more difficult. First the footprint. If anyone from NEMO reads this I have to ask you what is with the change in holds (they look like rings but with a cutout on one side) on the wider end of the footprint? Who decided to go with this design? I am not really sure how to attach it. I did but I am a little confused why you changed. No negative here only commenting it could a been a little better designed. Second the frame and poles: Setup of the frame was easy. Newer larger stakes make it easier to tie down the frame and the poles have been reduced to three legs with the single leg going into a grommet and the other two clicking into a newer version of their ?ball/joint? foots. Although I have not tried it with two people yet, the space inside gives the feeling and appearance of much larger than it really is. I felt comfortable and not cramped. While I have only spent one night in it (to follow below) I was actually surprised at the room I felt from head to toe. I will reserve judgement though until I have used it more. I say this only because I am taller than most and my biggest complain on my last shelter was just that, head and foot room. Third the rain fly: First of all two words very light. When I was first setting it up a brief gust of wind almost took it away and I to catch it last second. The material is quite thin and light. I will be interested in how it does in heavy rain. It does set up easily and stakes down like all their others. The one (or two in the case) attributes I absolutely love in the design are the twin vestibules and twin entrances. I had them in my last (Obi 2P) and swore I would use nothing else. They are very functional and even more so when by yourself. Although I do not see much change in this area it is still nice to have them. Overall I am impressed with my new little shelter and to be honest do not really have any true negatives at this point. I plan on updating this review as I use and learn more about the Hornet 2P but in my opinion NEMO again has hit a home run. As mentioned above I did take it on a quick overnight pack just to test it out and while I saw no rain only extreme heat, my shelter performed beautifully. Having taken the time to go through setup when I got it really helped so set up even easier. The smaller size even made me think I left part of it or I was missing something else when I packed my pack. I felt while inside that I had plenty of room. Air circulation (albeit there really was none considering where I was) did not seem to be as stuffy as it was in my last shelter. I could have used it without the rain fly but I really wanted to see how it functioned overnight with air circulation. I do expect to find out more on this as I use it. I will update again after my next outing. We'll look forward to your updates, Michael. 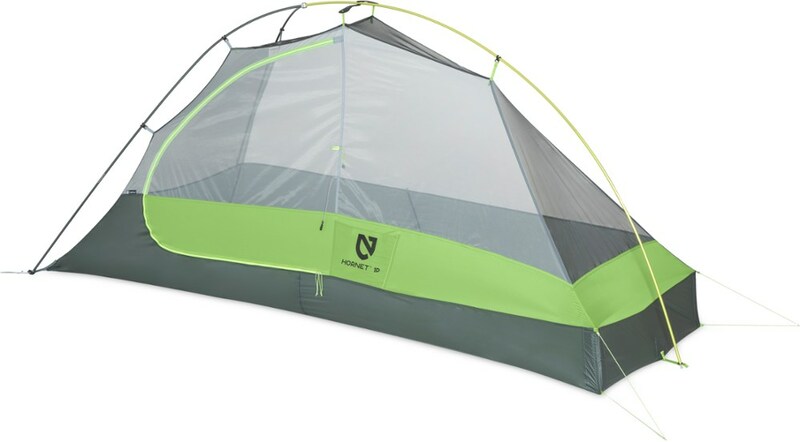 I'd also love to see some pictures of this new tent.